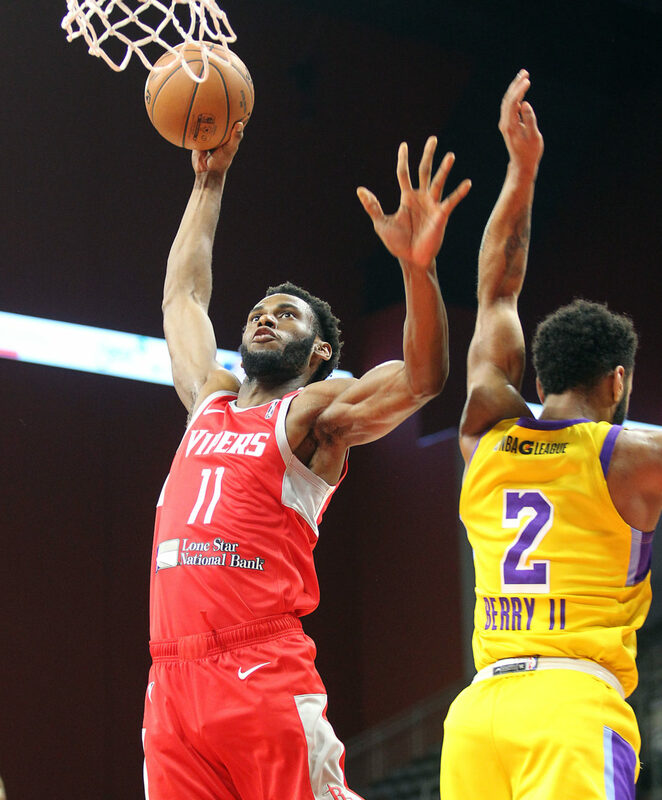 EDINBURG — The RGV Vipers were nothing more than mediocre during the first part of the season. Some nights they looked like world beaters, other nights they looked like a beaten world. First-year coach Joseph Blair, though, kept preaching the same words. He talked about culture and defense first and playing Vipers basketball. You could hear him on the sidelines regularly encouraging his team to apply”ball pressure.” He had little concerns about his team’s offense – offense is something they can do in their sleep with a deadly combination of slashers, big men and 3-point sharpshooters. After a 9-9 record to start the season, however, his broken-record teachings started to sink in. The Vipers won 13 of their next 14 games. In seven of those games, they kept their opponent under 100 points, a massive achievement in a league where it’s fire all Rockets (Get it? It’s a play on words) at all times. During a six-game stretch the Vipers held opponents to 89.1 points per game. That 13-1 stretch vaulted the Vipers to a 22-10 record and they finished the season 12-6 en route to a 34-16 record, one of four teams in the league to finish with that same mark. Whether it’s at the NBA level or at the G League level, there are certain rivalries that seem to remain rivalries at any level of play. The Vipers, affiliates of the Houston Rockets, and the Santa Cruz Warriors, affiliates of the Golden State Warriors, will renew that rivalry at 8 p.m. Tuesday in the Western Conference Finals. It’s a one-game, winner-take-all matchup for a trip to the best-of-three championship series. The Vipers and Warriors have played three times this season. RGV won the season series 2-1, the Vipers winning 96-95 at Santa Cruz and 97-89 at home before falling in the final meeting 92-91 at home. The Vipers were 3-1 overall in games decided by just one point, also beating Salt Lake City 103-102 on the road and the next night winning at South Bay 128-127. No matter how high scoring the team and the league, big stops on defense can make a difference. Against Memphis, Roger Moute a Bidias showed that in the four. Bidias scored all six of his points in a four-minute span in the third quarter but those points were a result of solid defense in which he registered a blocked shot that led to a fast break basket, a steal that led to him getting sent to the free-throw line where he sunk both shots and he frustrated guard Jay-R Strowbridge into taking a poor shot – all during that time frame. The Vipers were up 11 when that run started and after Bidias was done, they were up 110-91. Isaiah Hartenstein wants to leave the RGV. Well, let’s put that better context. He loves playing here, he really enjoys his teammates and the people and the facilities. He’s also developed a solid relationship with coach Blair, but he is focused on a bigger prize – full time NBA play. Hartenstein played 28 games with the Houston Rockets this year and each time he has returned to the Vipers, he has been more dominant than when he left. Currently he is averaging about 20 points and 15 rebounds per game. The 7-foot center has a nice passing touch, has a nose to get to the ball off the rim (10 offensive rebounds in the last game) and has a soft shooting touch, being able to bring opponents out past the 3-point line to defend the shot from that far away.